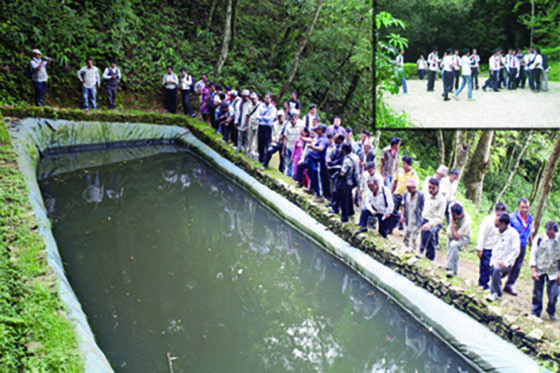 Every year, some 600-700 people (policy and decision makers) visit the knowledge park simply to look at the methodologies displayed and learn about the range of interventions that are possible to support integrate mountain farming, income generation, and livelihood improvement approaches and a further 800-1,000 farmers and organizational staff and more 2,500 students take part in specific training and study tours. The visitors include government ministries , senior staff from governments, INGOs, NGOs, and UN organizations, community leaders, scientists, academics, representation of womens and farmers groups. Over the year more than 5,000 people from 72 different countries and 40 major international organizations. The trainees and students take with them knowledge and skills that are used directly in village communities across the region. The many other visitors take with them images and ideas that are passed on many times, building a potential for change and raising awareness of the possibilities across the Hindu Kush Himalayas and beyond. The comments in the Visitors Book include such accolades as A real introduction to the life and potential of these forests. I will look differently at them now. A beautiful and stimulating work that certainly inspire hope, and I wish to introduce the example of SALT demonstration here to many poor mountain areas so as to help the mass there raise their living standards because of work here is successful and encouraging. It is excellent indeed. Excellent Knowledge Park to disseminate appropriate technologies with this catchment village and natural resources, the park has huge roles to transform the rural economy on the principles of sustainable development. Wishing the ICIMOD and the rural people all the success in leading the process of change.